Our client bought her apartment a while ago, since the place needed a renovation we were there to make her dream come true. 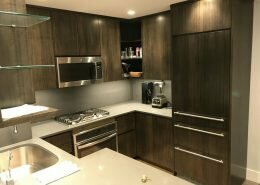 In this project we demolished the kitchen, the bathroom, we ripped out the old floors, we added new light fixtures, in some areas we added new gypsum wall boards, all walls were skim coated. 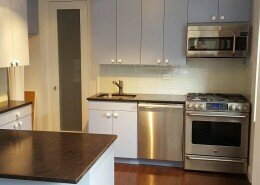 It was a one bedroom apartment with living room, one bathroom and kitchen. In this case, we did not change the layout. Starting from the kitchen, we removed old cabinets, old appliances, old floor. The new electrical panel had to be relocated to the hallway, it was in the kitchen previously behind the cabinets, in accordance with the local laws, it could not stay there. In the kitchen remodeling our client got beautiful custom made white shaker style cabinet fronts with some special detail, beautiful white Carrera stone counters, grey subway tiles in the backsplash, under mount dimmable cabinet LED light, ceiling slim recessed dimmable LED lighting, the new tiled niche under the window, the tiled floor that was set in herringbone pattern and stainless steel appliances. In the bathroom, the old bathtub stayed in its place, we only had to resurface it. New white glossy subway tiles were installed on the walls. We built for her custom made bathroom vanity and medicine cabinet. On the ceiling, we added slim recessed dimmable LED light and one light above the medicine cabinet. 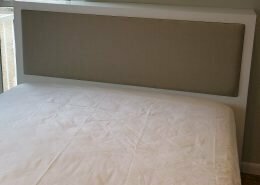 In the living room, we installed new gypsum wall boards on the ceiling and on the wall due to severe cracks. On one of the walls, we added two beautiful wall sconces. In the bedroom we built custom made closet with four doors; the closet interior was made of walnut veneer, the closet doors, as well as the rest of the new doors within the apartment, were fabricated in the same style/ design. The closet equipped with motion sensors, once you open the closet door the closet became illuminated; we used dimmable LED strip light inside. 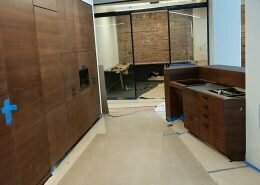 We used white oak wood floor planks with natural, polyurethane matte finish. 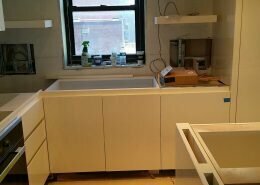 Moreover, we installed new baseboard, door and window casing molding, wall picture molding and crown molding in the kitchen. You be the judge and tell us how we did. We want to hear some feedback from you. 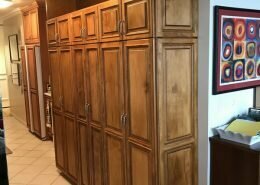 Basically, we built her new custom-made kitchen with lots of drawers, custom made living room closets with shelving units, custom bathroom vanity, custom build in unit with drawers in the lower part and doors in the upper section. All units interiors were made of pre-finished maple and outside lacquer finished was matched with Benjamin Moor paint color with more glossy sheen. Overall, the project was finished with total client’s satisfaction. We removed old cabinets, moldings, floor, and other elements. 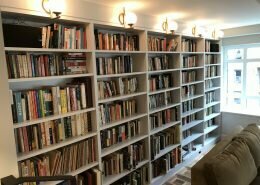 We renovated walls, ceilings, and floor. We worked on custom finishing, materials and sizing. 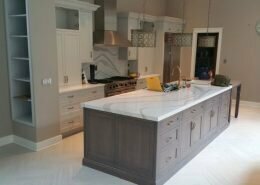 We installed all the cabinets, molding, trims and lights.